(a) Portrait of Magnus de la Gardie by Matthias Merian (1649). 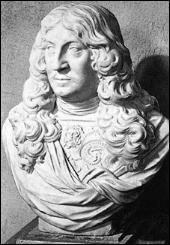 (b) Bust of Magnus de la Gardie. There is an estate named Råbäck in Västergötland (on the Kinnekulle mountain) and, according to Michael Cox's Casting the Runes annotations, MRJ visited it and wrote a letter to his parents from there on August 10, 1901. However, he states quite specifically in "Count Magnus" that while the house in the story "is to be called Råbäck... that is not its name". Having chosen to place the fictional house close to Magnus Gabriel de la Gardie's real tomb, his selection of an appropriately local name for it might not even have been a conscious decision. At any rate, I think we must take him at his word when he says that Count Magnus's house is not really Råbäck. Some aspects of the fictional manor-house may have been inspired by Magnus de la Gardie's own estates in the area (surely not, however, his most famous residence, Läckö Castle on Lake Vänern, which is just that - a picture-book castle - and was only renovated, not built, by him),(6) but others seem to point elsewhere. We are told by MRJ that there is a picture in "Dahlenberg's Suecia antiqua et moderna", that "it is one of the best buildings of its kind in all the country", and that there was a "correspondence between Sophia Albertina in Stockholm and her married cousin Ulrica Leonora at Råbäck in the years 1705-1710". The house with which Ulrika Eleonora (1688-1741), sister of King Charles XII and briefly Queen of Sweden in 1719-20, is most closely associated is Ulriksdal, just outside Stockholm. The current exterior dates from the time when she lived there. It is still a royal palace today, and is part of a huge eco-park, very popular with tourists and day-trippers from Stockholm. "Dahlenberg's Suecia antiqua et moderna" is actually the Suecia Antiqua et Hodierna of Erik Dahlberg (1625-1703), where an extremely fine engraving of Ulriksdal appears. 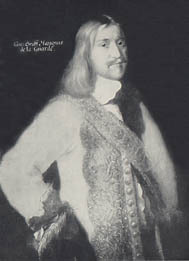 There is a connection between Ulriksdal and Magnus de la Gardie for he owned the palace in the middle of the seventeenth century, but he was not the builder. 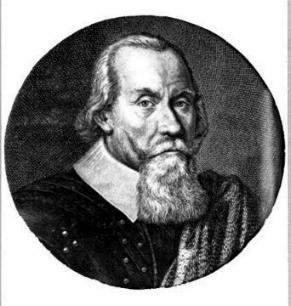 Since, in the story, Count Magnus built Råbäck "soon after 1600", should we look to the founder of Ulriksdal - or Jacobsdal as it was originally called - as a possible candidate for MRJ's inspiration? I think so. Jacobsdal was completed around 1644 and was built by one Count Jacob Pontusson de la Gardie, who was none other than the father of Magnus de la Gardie. Jacob (1583-1652) was a great Swedish statesman and soldier. He commanded the Swedish forces in Russia which captured Moscow in 1610; in 1626-28 he was commander in chief of the army which fought against the Polish in Livonia; and later he served as one of the regents during the minority of Queen Christina (1632-44). (7) More to the point, an engraving of him could serve uncannily perfectly to illustrate MRJ's description of Count Magnus's portrait: "the face impressed him rather by its power than by its beauty or goodness; in fact... Count Magnus was an almost phenomenally ugly man". This is in no way sufficient evidence to convict Jacob de la Gardie of being MRJ's Count Magnus, but I would suggest that he was a much greater source of inspiration for MRJ than Magnus de la Gardie. Perhaps MRJ created Count Magnus as a sort of portmanteau figure based on several members of the family. There is one final piece to add to the jigsaw, implying just that. MRJ describes several ornamented panels on the tomb of Count Magnus: "One was a battle, with cannon belching out smoke, and walled towns, and troops of pikemen". In Tallinn Cathedral in Estonia, over the Baltic from Stockholm, there is a tomb with a fine panel depicting a battle scene (even if MRJ never visited this cathedral in person, he may well have seen photographs). Here too are cannons belching puffs of smoke in the foreground, three walled towns, and armies of pikemen. It depicts the siege of Narva in 1581, which was a highlight in the career of the celebrated Swedish soldier whose body lies within. The tomb belongs to Pontus de la Gardie (1520-85), the father of Jacob and grandfather of Magnus. Whereas, in "Count Magnus", MRJ says that Råbäck is not the real name of the manor-house, he uses an entirely different turn of phrase when first introducing the family who built it: "De la Gardie is the name by which I will designate them when mention becomes necessary". Although occasionally careless with his facts, MRJ was not prone to lack of care with his phraseology. By not ruling them out of the "Count Magnus" equation, was he hoping the reader would take the hint and do likewise? (1) Michael Cox, M.R. James: Casting the Runes and Other Ghost Stories (Oxford, 1987), p.310. Cox's notes are also in A Pleasing Terror: The Complete Supernatural Writings of M.R. James (Ash-Tree, 2001). (2) Sven Stolpe (ed. and trans. Sir Alec Randall, Ruth Mary Bethell), Christina of Sweden (Burns & Oates, 1966), pp.66-79 (section on Magnus de la Gardie; quotations from pp.70, 77). Susanna Akerman, Queen Christina of Sweden and Her Circle: The Transformation of a Seventeenth-Century Philosophical Libertine (E.J. Brill, 1991), pp.40, 314. (3) Susanna Akerman, "Christina of Sweden (1626-1689), the Porta Magica and the Italian poets of the Golden and Rosy Cross" on the Alchemy web site. (4) Cox, Casting the Runes, p.309. (5) Despite the obfuscating acknowledgement to "Count Olof de la Gardie, both for his hospitality at Rabäck [sic], and for allowing me to inspect family papers relating to his ancestor Count Magnus", we can assume that the information about a second Magnus de la Gardie given in Colin Wilson's The Space Vampires (1976) is as solidly based on fact as his assertion that Chorazin is in Hungary! All evidence in "Count Magnus" to the contrary, Wilson insists on placing "Rabäck" on an island in Lake Storavan in northern Sweden. (6) As far as its appearance is concerned, Mariedal (which Magnus de la Gardie built in the 1660s for his wife, Maria Euphrosyne) is a better - but far from perfect - candidate. However, if MRJ had had this in mind, he would scarcely have resisted recounting a well known legend associated with its location: that Magnus moved the building materials from the place where his wife wanted the house to the position that he had selected, and blamed it on trolls! (7) Entry for Jacob de la Gardie in the on-line Encyclopedia Britannica. (8) The connection between alchemy and Jacob de la Gardie was made by a poster to the Message Board of the Alchemy web site in July 1999, without any awareness of a possible link with MRJ's "Count Magnus". Although backed with book research, most of the discoveries described here were made on the Internet. Follow these links for pictures of Ulriksdal, Mariedal, Läckö Castle, Varnhem Abbey, the Codex Argenteus and the De la Gardie tomb at Tallinn (including the "Count Magnus" panel). Copyright &COPY; 2001 Rosemary Pardoe.